Fri., March 10, 2017, 8:03 a.m.
BOSTON – Save the light reading for later. In 2017, dystopian fiction is all the rage. Longtime staples in English literature courses, dystopian works are attracting new attention from casual readers and social book clubs. Local theater groups are adapting versions for the stage. College courses on dystopian classics are suddenly drawing long wait lists. Much of the renewed interest has followed the November election of President Donald Trump, which publishers and scholars say is no coincidence. One edition of “1984” has seen sales jump by 10,000 percent since January, when Trump adviser Kellyanne Conway defended incorrect claims as “alternative facts” in a TV interview. It instantly drew comparisons to the type of government manipulation Orwell wrote about nearly 70 years ago. Other critics have said Trump’s views on immigration and the news media, while not unique, would fit neatly into the plot of a dystopian tale. In college classes on dystopian works, students have been eager to draw their own parallels. Dozens of U.S. movie theaters are screening a film version of “1984” in April as a protest against many of Trump’s policies. “Orwell’s portrait of a government that manufactures their own facts, demands total obedience and demonizes foreign enemies has never been timelier,” the group United State of Cinema, which is organizing the protest, wrote in a statement. Those types of barbs are far from new in American politics. Critics of former President Barack Obama compared him to the watchful Big Brother in “1984” after a vast government surveillance program was detailed in 2013 leaks. Sales of the novel surged then, too. In the case of Trump, some scholars say the comparisons are largely unjustified. Quentin Kopp, a leader of the nonprofit Orwell Society, said there may be some similarities but that “it’s easy to overstate these parallels or dig too hard.” His group seeks to promote Orwell’s life and works but takes no political stance. Some experts say readers often return to dystopian works during periods of great change, hoping to find out how they can avoid the nightmarish worlds the works depict. Beyond the U.S. election, readers might be jarred by events like the global refugee crisis, some say. Others say new adaptations of classic works have fueled renewed interest. Hulu is releasing a TV version of “The Handmaid’s Tale” in April, telling the story of a woman in New England after an oppressive religious regime takes over. In June, a British stage production of “1984” is headed to Broadway. 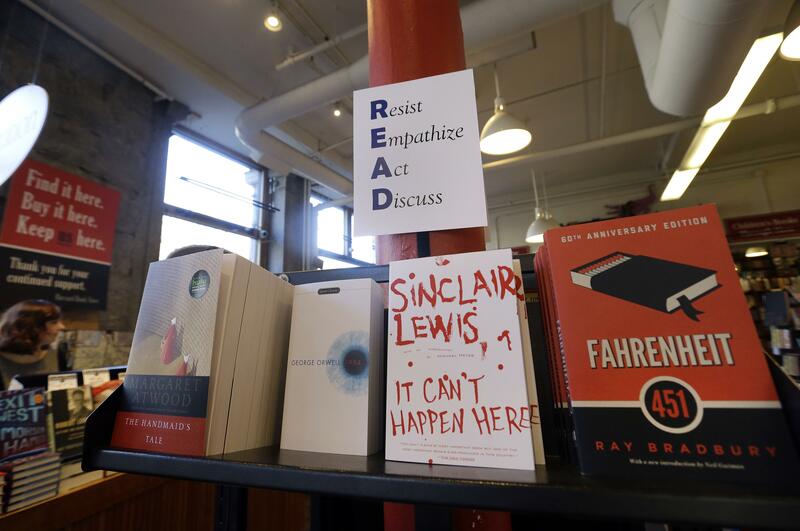 John Morillo, who teaches a course on dystopias at North Carolina State University, said readers have long enjoyed dystopian fiction because it lets them experience the thrill of something horrific without the threat of real danger. But now he sees another benefit – it can offer readers a comforting reminder about the world today. Published: March 10, 2017, 8:03 a.m.